POMONA, Calif. – It was on an exciting and nostalgic night at the Pomona Fairplex in Southern California as the Red Bull Straight Rhythm brought top riders from all faces – including retirement – for a special head-to-head bracket style of racing with 40 seconds of wide-open obstacles aboard two-stroke machines only. Troy Lee Designs/Red Bull/KTM’s Shane McElrath emerged as the winner of the premier 250cc division, besting four-time AMA Supercross Champion Ryan Dungey, who finished second for the night aboard a Red Bull KTM 250 SX in his first race back since retiring from professional racing in 2017. McElrath, who has never raced a 250cc two-stroke before, earned the third seed heading into the bracket racing. He faced Darryn Durham in the first bout, sweeping the first two races to advance to round two. There, McElrath faced retired KTM racer and now team test rider, Ryan Morais, in a close head-to-head battle. Morais held his own in both motos but it was McElrath who prevailed to the semi-final round, where he lined up side-by-side with his Troy Lee Designs/Red Bull/KTM teammate, Jordan Smith. McElrath and Smith split race wins, which brought it down to a third and final race to decide who would move on to the final round. The KTM duo was evenly matched in the beginning but McElrath grabbed the edge right at the end to best his teammate and move onto the final round. For Dungey, he came out of retirement with a bang as he took the number one seed into race one, where he topped Mike Brown in the first two races. In round two, Dungey faced French rider Cedric Soubeyras and he put in two good runs to move onto the semi-final round, where he went up against longtime rival Ryan Villopoto for a spot in the final round. Dungey remained steady in both races to best Villopoto in what proved to be one of the most exciting moments of the night as the old championship rivalry came to life on the straight rhythm course. It was a battle of the KTM 250 SX in the final round as McElrath lined up against Dungey for all the marbles. 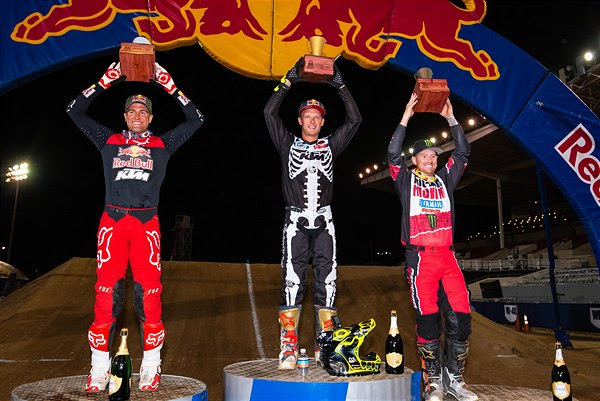 McElrath, who has won the Red Bull Straight Rhythm twice before in the Lites Class, found the early advantage and bested Dungey in the first race. Switching sides, the duo battled again in race two but this time it was Dungey who prevailed, leaving the final winner up to a third race. Despite a hard fight by Dungey, McElrath dominated the final race to claim the overall title. Dungey finished second in his first race since retirement.